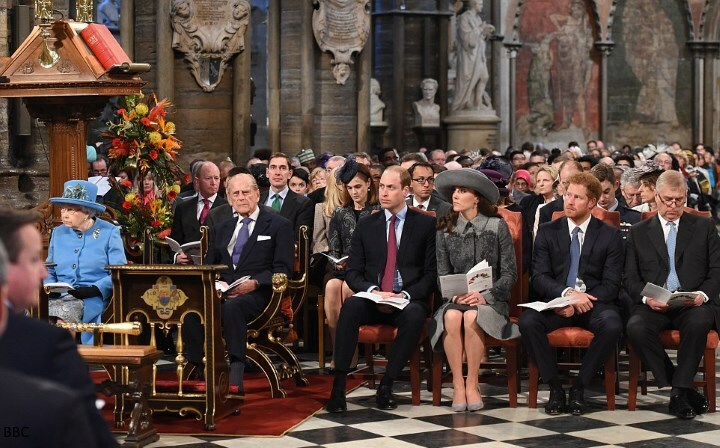 The Duke and Duchess of Cambridge, Prince Harry and The Duke of York joined the Queen and the Duke of Edinburgh to celebrate Commonwealth Day by attending the Commonwealth Service at Westminster Abbey. It is the second consecutive year the Cambridges have attended the service. As head of the Commonwealth, the Queen has reinforced links and seen the association of nations grow from seven to fifty-three members during her reign. One day Prince William will assume the important role - and like the Queen - play an important part as symbol of unity at the heart of the Commonwealth. 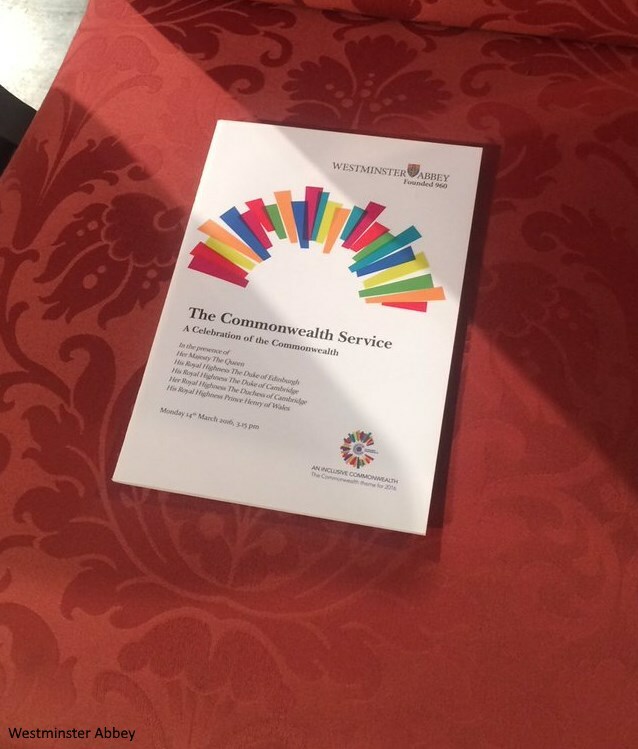 The Commonwealth Service the is the largest annual inter-faith gathering in Britain. 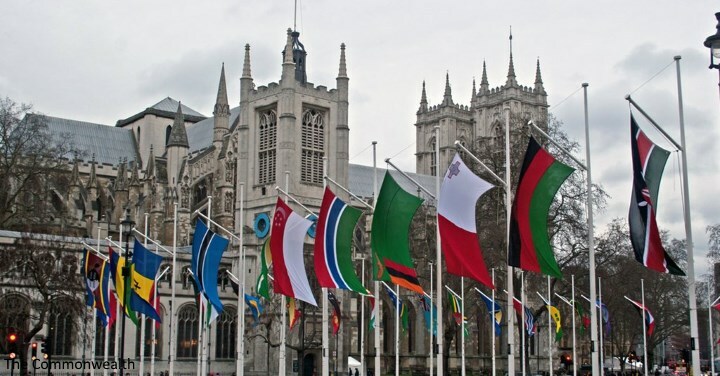 Held on the second Monday of March it is a unique opportunity for people from all over the world to come together to promote shared Commonwealth values of peace, equality and the association's rich diversity. The royals were welcomed by Rev. John Hall. Each year a specific theme is chosen to help guide plans and activities for Commonwealth organisations. The theme for 2016 is 'An Inclusive Commonwealth', emphasising a vast community which embraces 2.3 billion people, of which 60 per cent are under 30 years old. 'Each of us can also make a positive difference in the lives of others by being willing to contribute and offer support. This is an essential ingredient of belonging to the Commonwealth: the willingness to share, to exchange and to act for the common good. By including others, drawing on collective insights, knowledge and resources, and thinking and working together, we lay the foundations of a harmonious and progressive society. The greater the diversity of those included in such a shared enterprise, the greater the gains. Each of us has cause to celebrate the sense of belonging expressed in our 2016 theme: 'An Inclusive Commonwealth'. Our recognition of this value, and the wisdom of mutual respect for each other, is set out in the Commonwealth Charter. Its opening words, “We the people of the Commonwealth” convey the conviction that individuals, as well as governments, build and shape our success. 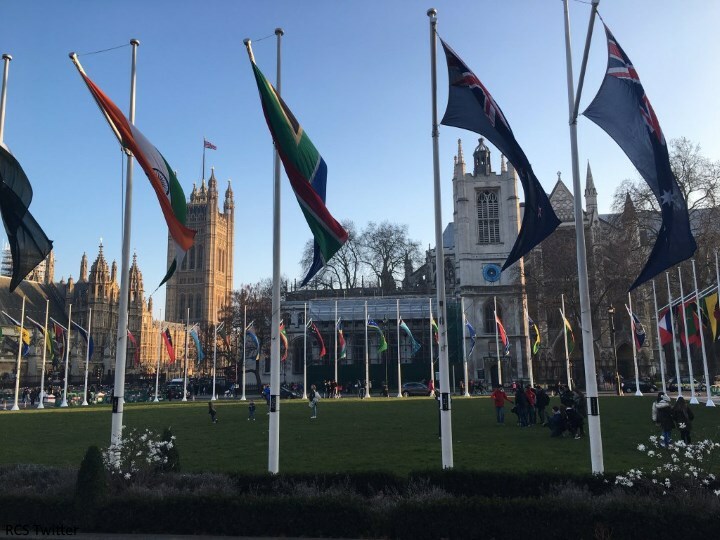 The fifty-three flags of the Commonwealth nations in Parliament Square. Young people across member countries were asked to explain what 'an inclusive Commonwealth' means to them. For some, it is about being part of a community of nations where each and every citizen enjoys freedom, success and can live a dignified life, while for others the theme represents a call to action to tackle some of the world’s greatest challenges such as climate change and human rights. The 2,000 strong congregation included over 1,000 school children, the Commonwealth Secretary General, H. E. Mr Kamalesh Sharma, and the new Commonwealth Chair-in-Office, Prime Minister of Malta, The Hon. Dr Joseph Muscat, alongside High Commissioners and Commonwealth dignitaries. The royals listening to readings. Highlights of the Service included the principal reflection to be given by Mr Kofi Annan, Former Secretary-General of the United Nations. 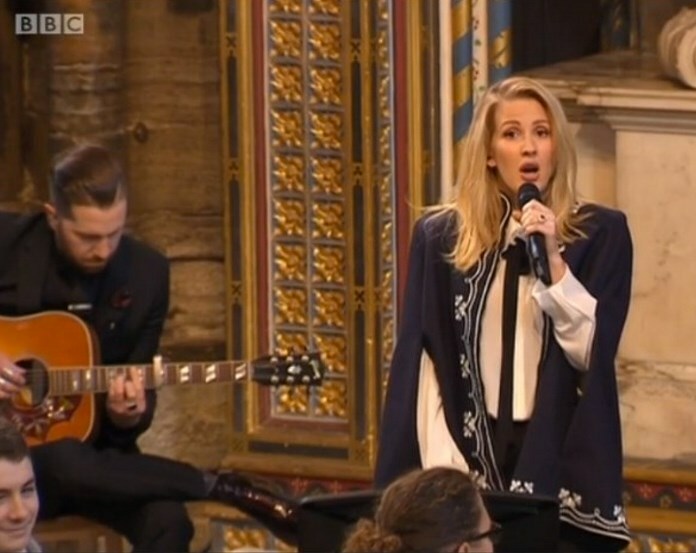 There was also a musical performance of 'Fields of Gold' by Ellie Goulding. Of course royal fans will be familiar with Ms Goulding who performed her version of 'Your Song' for William and Kate's first dance at their wedding reception. The singer recently revealed: "I did their first dance and like, talk about scary. I was so nervous, my hands were shaking. That's one of my memories, looking down at them and just seeing them shaking." It's a rather special coincidence for the Cambridges to see Ellie performing at Westminster Abbey, where they married almost five years ago. 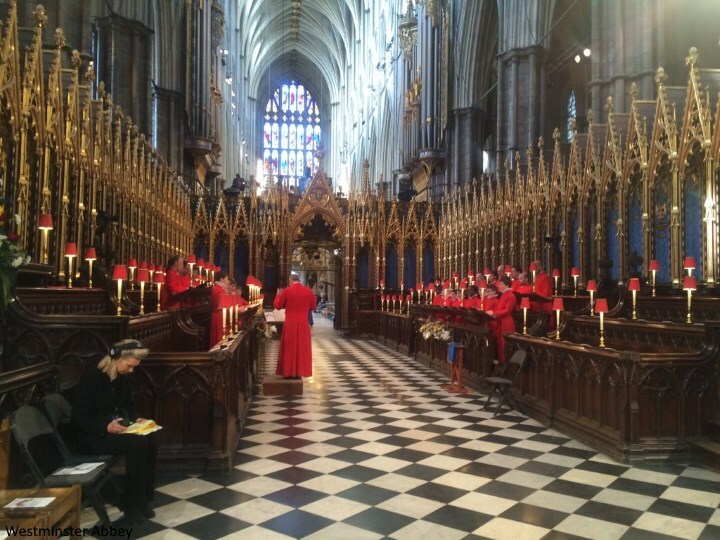 Westminster Abbey shared photos of preparations underway before the service. A look at the order of service. It can be viewed in its entirety here. 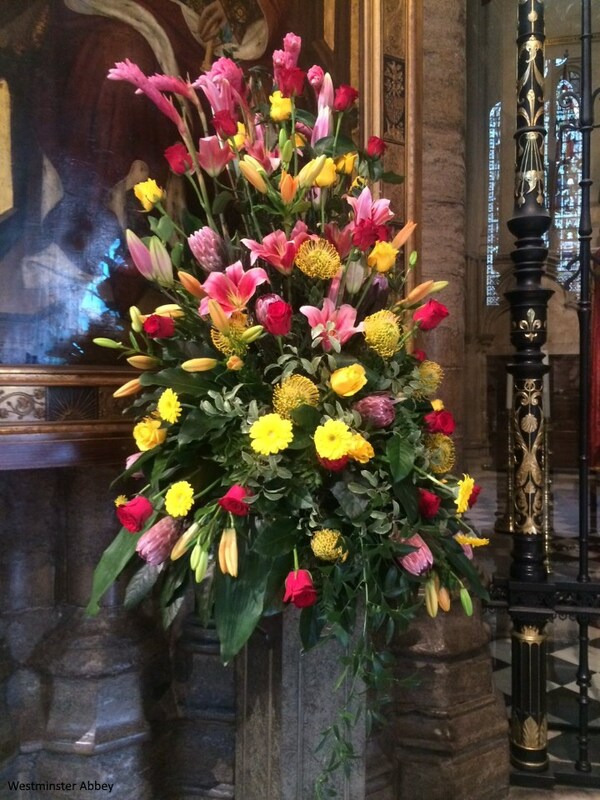 A photo of the beautiful flowers on display at the abbey. The service concluded with a procession of Commonwealth flags. The royals then met people involved in the service. Our favourite photographer James Whatling snapped a lovely shot of Rebecca Deacon and Prince Harry's private secretary Edward Lane Fox. Following the service, William, Kate and Harry walked through the Dean's Yard to attend a reception. 'Kate, 34, revealed that her daughter Charlotte is "getting bigger by the day", while her son George is developing a passion for anything with wheels. "He's got a scooter. He's going super fast on it," said the Duchess, rolling her eyes to a group of schoolchildren outside Westminster Abbey. "It's hard to keep up with him! Charlotte is keeping him in check‎," she added. "She's getting bigger by the day." The Duchess debuted a new bespoke coat by Canadian designer Erdem. Kate's coat very much resembles the Erdem Trench composed of wool, polyamide and cotton with lace effect and silk lining. Kate's piece has been customised to make it a nice choice for royal events such as services. I thought it a nice touch to choose a designer from another Commonwealth country. The coat is from the pre-fall 2015 collection. Kate wore a grey dress underneath. Kate's wide-brim grey hat is by John Boyd. Below we see a very similar hat (with thanks to Anna). 'At one time in its history Beauchamp Place, Knightsbridge, could boast forty-four milliners. Now, there is just one, John Boyd. Milliner to royalty and high society for over 70 years, this 90 year-old Scotsman has the versatility to dress three generations of the same family. That one of them happened to be the future Princess of Wales made all the difference. 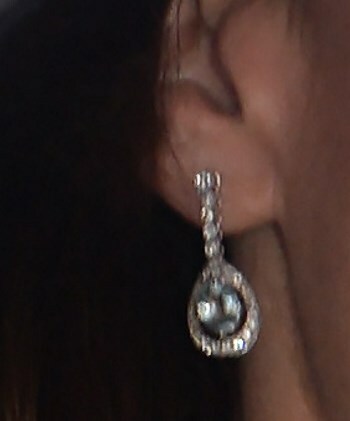 Kate accessorised with her UFO aquamarine earrings. Kate carried her Emmy clutch. A look at Kate's grey suede pumps. Middleton Maven received confirmation they are the Winona pumps by Rupert Sanderson. There's an arrivals video available at YouTube. We'll see Kate next on Friday, when she will officially open East Anglia's Children's Hospices' new charity shop in Holt, Norfolk. Fabulous! Erdem! I love love love the hat! Huge fan of a bigger hat! She looks gorgeous! She looks fantastic and I do agree about the larger hat. LOVE this hat and hope to see many more of them. It's a very sophisticated and polished look. DoC today looks happy. I live the hat. It suits her so well and it's very flattering. I like it more than fascinators,but it is a personal taste. I'm not fond of the coat. It's too dark I guess. And I would have put shoes and a bag in another colour. Yikes...I think this outfit was a total misfire. Dowdy, dull, frumpy and that hat looks like something from the 80s. Totally agree! :( it's too dark for this time of year as well. Ick! Agree! I'm thinking this is one of those "looks great on the model/hanger" and then is a total dud when you get it home and put it on. The version on the model is better, not great, but better than this frumpy floursack. at the same photos? Kate would even look good in a frumpy flour sack though btw. but today she looked stunning. That hat is so Downton Abbey-esque to me! I love seeing Kate in a good wide-brimmed hat every once in awhile. I'm not so sure about the coat, I think I would prefer it without the lace overlay effect. Yes! I loved seeing Kate in a different style hat, and the throwback vibes were so classy. I hope she'll continue to mix it up and keep trying different hat shapes and styles. I also don't know if I love the lace effect on the coat, but I get that it was the major interest in the outfit--otherwise it's a pretty bland grey ensemble. I would like this coat so much better if the scalloped- lace detail on the torso went straight across the upper sleeve. I don't like that that the sleeve has lace all the way up. What a really inspiring service in these times. The diversity, and that speech by Sara from Malta! Really poignant. And so many other good points during the service! I am really happy that the younger royals are at this service. Half of the people in the abbey are children and young people and it's great to see the continuation and future represented in not just the congregation, but also in the royals. Random thought: How did the 1000 kids and youngsters matter to be so quiet for that long?! Kudos! On the less important things: Wow, Kate looks absolutley sublime today! I'm not one of those that cries for a big hat all the time, but I cannot deny how stunning she looks in one! If I'm gonna be picky, the coat could be a bit better fitted since it gaped a bit, but meh. She looks wonderful either way! Also, I love the coat. It's proper and classic, but with a twist. I love the special fabric and from afar I thought the lace was printed, but it's cool that it's a heavy, modern fabric with real lace over it. Very nice! Also, I think they grey colour works. It doesn't look mourning, but rather just solemn and muted. I think as always that she does a great job to "blend in" as much as she can when in the presence of Her Majesty while still looking appropriatly dressed up. I also loooooove her earrings. So much that for a few weeks earlier this year I emailed and searched all over for identification. No luck though. The most I heard was that the style looks similar to a common Victorian style of earrings. Oh well. Normally, I'm not a fan of suede shoes, but I must admit that these pumps were a perfect match for the outfit. Hi Rebecca I think any process for making Charles the head of the Commonwealth (assuming he becomes King) is likely to be a formality. The Declaration that set up the Commonwealth states that the monarch is the symbol of the organisation. The advantage of the monarch being the Head is that they are politically neutral & this is very important in holding the Commonwealth together. I like this outfit overall but not crazy about it. It is a nice coat but my fave grey is the McQueen that she wore in Australia. To be honest a bit expected that to show up. That was a super elegant, clean and awesome choice. I find it a bit casual, such as the hat. Also maybe the pattern distracted me too. She always wears a plain coat in church not a patterned one.The hat is huge but Kate has a great face so she can pull anything off. Overall I think she should have worn it anywhere else. I do not know why I feel this way, seeing the Queen wearing a simple coat did not help too. But maybe it is me only. When Kate chooses Erdem, it's generally a miss for me. With the exception of the two blue/navy lace dresses she wore on the Canadian tour, her Erdem choices always seem frumpy. She is dressing much older than her age in this outfit. I know the occasion is formal, but she can still look formal without dressing like Camilla. I don't think Camilla could ever look this good. This is such an edgy look! I am not sure how I feel about it. I certainly like the fact that it is so different than what she typically wears. However, that hat is way too big. I think if she had a more tailored hat the whole look would be more sophisticated and not quite as heavy looking. I agree, the hat is way too big. I think it swallows her face and it does make the whole outfit look heavy. I love this outfit,classy and elegant..just like the Duchess. I wish she wouldn't have taken the belt off..The coat would be better with it. Don't you think? But still she is happy,beautiful and elegant. Do we need more? I also don't really get all the fuss about the St.Patric's Day event. I understand that people just want to see her-believe me I know the feeling- but she is still a mother of two.. So we should stop criticising her. I think adding the belt would take away from the formality of the coat and of the occasion. Just a thought. This outfit seems too closed up to me personally. I love the hat but I think it needed something more streamlined or opennecked to balance it out as with her loose hair, big hat, high collar and loose coat she looks swallowed up by it. In general, her hair has been amazing recently!! I agree with everything you've said. The hat is fab, but there's too much going on around her neck. Her hair has been looking great! I really love Kate's look from today. I know lots of people may think this coat looks too cluttered but I like it. I love her hat, even if it needs an updo, maybe? I don't like Ellie Goulding too much, but it's interesting that The Cambridges like her! I thought they had someone like Elton John or other superstars at their wedding reception... I didn't know they chose Ellie Goulding. I love her new hat but I think black shoes/clutch would look better. I think black would push it into a more mourning look. It needed to be monochromatic. Muted gray. It's fab! I really like this understated sophisticated look and love the hat. She looks a lot like her mother. The version of the coat worn by Catherine is much nicer than the trench version shown which is too fussy. It reminds me how Diana's clothes got simpler and more sophisticated as she got older. It is interesting to compare Catherine's outfit with the Queen's. Totally agree about how Diana's style evolved. And I too thought of Carole. Elegance does run in the family. I really like this look and Kate actually looks younger to me. The hat is extremely flattering and brings me back to her appearance at William's graduation (and the black hat). I agree with all you said, Annette and royalfan. The hat is one of may favorites from her. The shoes are perfect with it and the coat. I am surprised that I like the coat so much as it is not something I would typically like, but the whole picture is a wow to me. Someone commented that her hair would have looked wonderful in an up-do and I agree, but I still think it looks amazing this way. I'm torn on that! Hopefully she wears this hat again with it up so we get the best of both worlds. I hope you are right about how her style evolves. Diana just got better and better over time. I think Kate will, too. For me, today was almost as good as Easter in Australia! From the pictures it looks like the base colour of the Queen's dress is grey as well. A great combination for she and Kate. While I appreciate the proper hat :) I don't care for this look and don't think it was appropriate for the event. It is a very drab, heavy look, which seemed to overwhelm her frankly, and this was a celebratory, colorful occasion. It would have been more suitable for a somber event - memorial, funeral, etc. It was really obvious to me how out of place it was when she stood in front of those enormous and beautiful spring flower arrangements, and again when she left holding the flowers. If she wanted to go neutral and favored grey, something like the Easter ensemble from the tour (which I thought spectacular) would have been more appropriate, this was a bad call for the event, in my opinion. I LOVE, LOVE, LOVE this outfit, especially the hat. It is the best possible choice for a wide brimmed hat, in my opinion, and it looks stunning on her. She had the best outfit, no doubt, style wise, but still kept it about the ceremony by choosing a grey. Love that it was a light, soft grey. This is one of her best three outfits in my opinion. I loved the red outfit and red hat when getting off the plane, and her brown and beige empire waist coat she wore early on after her marriage. So glad she wore a different style hat. She looked stunning. The Queen and Phillip looked happy and healthy. So thankful they are going strong. Thanks for the informative post, Charlotte. If Kate insists on wearing her hair down with hats, this Camilla-ish shape is a better way to go that her smaller styles. The coat is interesting but I find it a little dull. The Queen looks wonderful as always. Totally agree! She likes her hair down which has huge volume and she bigger hat works so well! I did not find her to be swallowed up at all as someone said here. I absolutley adored the hat! I like it. Reminds me of Maxima on 11/11, Veteran's/Remembrance(?) Day. @Katie 17:13: I thought of Queen Maxima too! What a lovely service! Now, this isn't my favorite look but it's appropriate & polished. I personally think more "open" necklines favor Kate's face more. This coat could look amazing with a stand-up collar or maybe a funnel collar? Love the hat! Again a different collar on the coat would've complimented the hat....but can't deny she looks beautiful. Surprising hat! Very nice total ensemble for the Duchess. LOVE THE LOOK! HRH knocks another one out of the park IMHO! Thank you Charlotte for the quick update. Blessings to all. Knocks it out of the park was exactly my thought-she looks amazing today!!! My first reaction as watching Kate arrive was WOW! She knocked it out of the Park - clear out. I love the hat, the color of the shoes and purse and those curls - oooo just love those curls cascading from the back of the hat, which made the look more youthful than if she had put it up. Loved that it was a different look for her! The curls were beautuful today. I hope we see many more large styled hats- HRH can really rock them. That coat is just awesome, I love the textured look of it. Way to go YRH! This coat is fabulous! Like it better than the original trench. And all the gray accessories complement the coat perfectly. Love the whole look! That had really makes her look more mature, doesn't it? But the coat looks cheap to my eyes. I love this new look. The wide brim hat is lovely, and the whole effect of her ensemble is spectacular. The entire family looked terrific. The Queen and Prince Philip are just astounding. Wonderful event. Thanks Charlotte for brightening a Monday morning. Wow just wow on this outfit. Hmmm, the coat is certainly interesting. I don't think I like it very much but it's not overly offensive. And I will always appreciate when she strikes out in something interesting or unusual. The fit does seem a little big/baggy, and verrrrrry buttoned-up. In general I don't like wide-brimmed hats on her and this isn't an exception. She looks like she's playing dress-up in her mom's wardrobe, much like at William's Passing Out parade. What a special event! I think the Duchess looks lovely, but I can't help but wish that she pair the gray ensemble with black pumps and a black hat instead. All of that gray is a bit too monochromatic and seems to overload her. Will and Harry look dashing! I wonder if black accessories would put it over the edge into mouring though. I agree. Black would have been too austere for this occasion. I agree too. Black would have been awful, and everyone would complain that she was wearing black shoes. The outfit is perfect as is, imo. Like the outfit. The larger hat is a nice surprise and I think the bespoke version of the coat is much more effective than the original trench style. However, I find I can't agree with those who are disappointed when she recycles. I've just discovered a website that shows all the clothes she has worn in public and how many times she has worn them. There are many that have only been seen once. 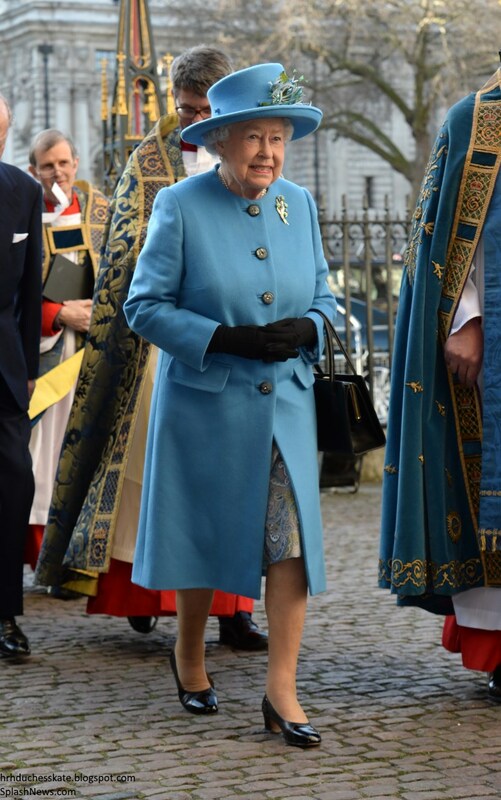 I think the pale grey 'Easter' coat or the mid blue funnel neck one would have been perfect for today, if she rang the changes with shoes and hat. There are so many people in need in the Commonwealth, I can't help thinking about the contrast with the royal lifestyle, so publically on display. I don't know if that is the site that maddogsslave is talking about but the site Kate's Clothes catalogue her wardrobe and when the pieces were worn. I love this new type of hat! She wears it very well, and I even think it suits her much better than the type she usually favors. I wasn't a fan of the Eponine suit but this look I absolutely love! Love the wide brim hat, love the gray color, love the lace detail on the coat. I like the different choice of hat, but I find the coat to be a bit drab despite the detailing. I guess I'm just not a fan of Erdem as I have never loved any of Kate's choices from that designer. I find the look to be great for Camilla or Anne, but "old" for Catherine. I am guessing she gets cold easily since she often buttons up to the neck or wears turtlenecks! I think the curls are lovely today. She looks lovely and put together, but sadly, it's not to my taste. And I usually love gray. The hat looks like the shape Camilla wears a lot. I'm so happy to see Kate in a hat rather than a fascinator! I've loved her fascinators, but it's just fun to see something different. Also, in the first picture you posted of William, Kate and Harry, Kate very much reminds me of Diana in the way she is sort of peeking out from under the hat. I love it! I love the fascinatiors, but I'm like you! It's good to see something a little different! You chose some lovely ones! I like the pic of Kate from the back, they are really rare. Good photograpghy and shot. Lovely picture choices Charlotte. As always a great big thanks to you. Love the coat and hat!!! Cheers to the Common Wealth! I definitely like Kate's look today. What a surprise that she chose a wide-brim hat. Reminds me of the black hat with the red coat she wore pre-wedding. I was expecting her to recycle today - perhaps the gray McQueen from Easter while on tour? Do you think that Kate suggests/requests the modifications to the original Erdem design? Interesting, I could see Diana wearing this look. Her hair looks very pretty today as well. I love fascinators - but I think it is refreshing to see her in a large brimmed hat! I also think the coat is very polished looking. Maybe I'm a big fan because I see this as a look that could easily be duplicated by anyone. Kate looked stunning today. And please nothing like Camilla. I feel it is a slap in the face to compare Kate with her, even if it just clothes. Kate has more class then Camilla. This is my opinion. Lovely as usual. Love the outfit today. I love how Kate is experimenting with new patterns recently. I'm not a fan of head to toe gray, but really like each piece individually. The hat is stunning! For some reason I think the coat could use a bit more structure. In some pictures it looks a little bulky, in others some strange puckering... but I know we are all victims to odd camera angles. All in all, happy to see the terrific trio out and about! Loved the hat on her. There are some stunning pictures of her in it. Coat is beautiful and the WKW site highlights the exquisite tailoring. Maybe the neckline and collar should not have been so closed, but overall a very chic and sophisticated look. No one in the audience was particularly boldly dressed. All muted shades. Queens outfit is from George's christening. Question: Why do their private secretaries publicly attend so many events? I have no issue with it, just curious. Does anyone know? 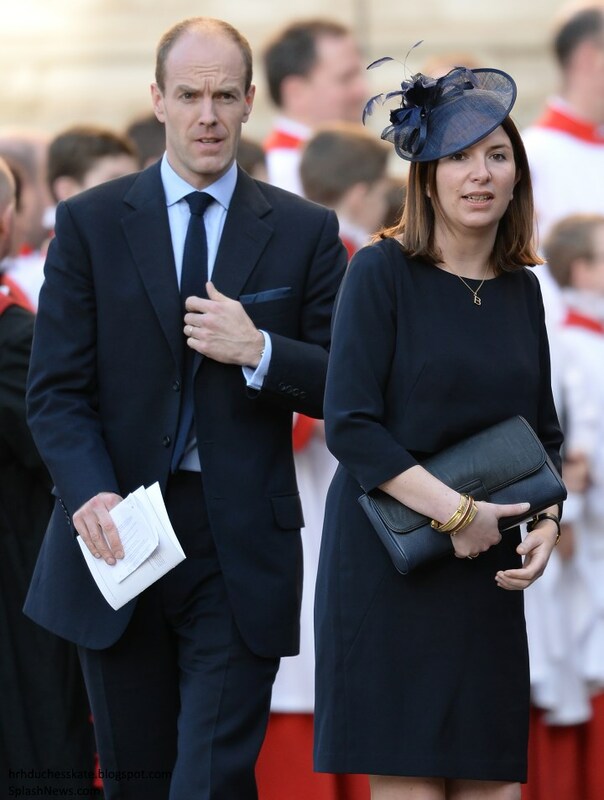 There is a picture posted here of Rebecca Deacon walking with Harry's private secretary. I assume this is "Becca". Thanks. Charlotte hadn't posted that yet. Becca is sure getting to be part of history. What a challenging but fun Job to have while she is single. I heard that she and a member of the PR team live together. Anyone know anything about that? Does anyone know WHY the secretaries attend events? I have no issue with it at all, just curious. Is it that they are also friends and tag along (which I doubt especially because of the nature of this event)? I completely get why they travel with them on trips but why would they be there in public at such a small local outing? Maybe to help keep note of anything that comes up while there? Maybe to be there if someone important asks about them? I really don't know, just guesses. I doubt they would send so many of them to one place. It doesn't make sense financially and timewise. It's smarter to have them do different places to cover more ground. The idea is, as Rebecca correctly noted, to cover as much ground and get to as many people as possible so a double royal tour wouldn't likely happen for security reasons, for cost reasons and just for practical reasons, two couples achieve a lot more going separate places than they would together! There used to be a royal rule, security-related, that no two royals who were back to back in line for the throne could travel together, i.e. Charles couldn't travel in the same vehicle as his mother, Charles and Andrew (pre-William) couldn't travel together. Diana famously broke that rule when she insisted on taking baby William to Australia AND in the same plane as Prince Charles! I think you'll see the royals steering clear of any official extended tours of Africa, even southern Africa, for a while. It would be a security nightmare. In my previous working life I was involved in helping to organise some tours to New Zealand. You are right Rebecca - the only times more than a couple of Royals came here together was when Anne and Charles were teen agers and accompanied their parents to the Commonwealth Games in Christchurch and also Diana brought baby William with her which was very unusual at the time! After the Commonwealth Games Charles and Anne went off to stay on a up country sheep station so they didn't have to do the more formal boring bits. Organising these tours is more detailed than you might think and security is particularly important. There were many weeks of negotiation before the tour as everything had to be mutually agreed. The royals are briefed in great detail not only on the country and local issues but on the people they will meet. It is not just up to the royals to decide what to do on these occasions, although they can express preferences, especially for any free time. I also had a chance to meet members of other royal families visiting here. Some were much more informal than our own royalty eg Queen Beatrix of the Netherlands who was really easy to talk to. I think a lot depends on how they were brought up and whether they went to school with others. Queen Elizabeth was educated by governesses and never went to school or college and it was only later during the war that she got to interact with people to any extent. The Duke of Edinburgh is much easier to chat to because he had been less cut off from ordinary life. Other Royal families, especially the Scandinavians, find it easier to interact with ordinary people and I am sure that is the reason. You will notice that Queen Elizabeth never hugs children or shows much emotion in public. The younger generation don't have the same inhibitions which is great to see. thank you all for taking the time to answer my question. now that i think about it, it would seem like a lot of work. I love Kate's outfit although it gave me a sense of deja vu - several royal ladies have worn coats of a similar shape and pale colour - Maxima most recently in France, Mathilde in Germany and Mette-Marit has a similar Chanel one too - nothing bad about that - each one has its distinctive elements. Choosing a Canadian designer is an excellent idea - wish Kate would use more of them - I was impressed with the designer who did Sophie Trudeau's gown at the White House and Pavoni does amazing gowns in the Saab style. The coat is elegant and much better than the off the peg model - which was far to fussy with those extra epaulettes or whatever they are called. Removing all that made the coat much more formal as well. His hats almost always have an elegant shaping and detailing that sets them apart and this is no exception. A very polished regal look - not something - whether I've liked her outfits or not - we've seen on Kate much recently so it's a nice change. The queen looked splendid in blue - it jumps out in the crowd. Not sure where Charles and Camilla were - has anyone noticed? Charles and Camilla have started their tour of the Western Balkans today and are out of the country. That is why they did not attend. Just noticing how many of us are suggesting that the grey 'Easter' coat needs another outing. I'm thinking that a lemon colour amongst the accessories would give it the Spring feel some people are looking for. I'm wondering how she decides when to buy new and when to recycle. Also how can she bear to wear many of her beautiful coats and dresses only once or twice? I have a feeling that Westminster Abbey is a bit chilly, and the Easter coat would not have been warm enough. But I also thought today's hat, hair down, and high coat collar, all very nice individually, made Kate look slightly muffled. I do like all the grey, as I love monochrome looks, and I also love grey flannel and grey suede. The hat and accessories are beautiful. The coat is vastly improved without the military frippery, but it seems strange that Kate's designers do not always make sure there is a fastener near the waist to stop gapping. Kate wore a Canadian designer, the Queen wore Australian opals and a paisley silk dress. Nice nods to the Commonwealth. I am not really sure why I like this look so much but she looks stunning. I agree that the color is drab, the coat isn't one of my favorites, but somehow I truly love the entire look. She looks stunning. I wish we also knew what she wore underneath. Her dress is either black or a dark gray to match the coat. This is an all around win for me. Thanks for sharing all of the information in such an informative post Charlotte. As always you are wonderful! Rebecca I think you are right. The skirt has the familiar pleats of the Orla Kiely dress. Thanks for sharing a link to that picture. This is a rare occasion where the coat wore Kate, not the other way around. I like the style of hat. But, this is a very somber look for something that is a celebration. The queen is dressed in a bright colour, the program has bright colours on it. Even though I'm tired of her black accessories, I think the outfit needed a contrast. I like the hat, but not the coat. I prefer the runway version of the coat with the trench details. Let's see...love the hair, the hat, the earrings, the shoes and the color, but that coat....I just can't connect. I think it might be the fabric pattern, cut and overall design. It seems busy and not well fitting. I think, at the end of the day, this is a miss for me. This would have been an absolutely fabulous look for me if the coat had no collar and just a simple rounded neckline like HMQ's. This and the green Erdem both look like they're reaching up and pulling her neck down into the hole! Less collar on both and I would LOVE them! Would have been a better balance with the larger hat too, which I like a lot on Kate. Yes! 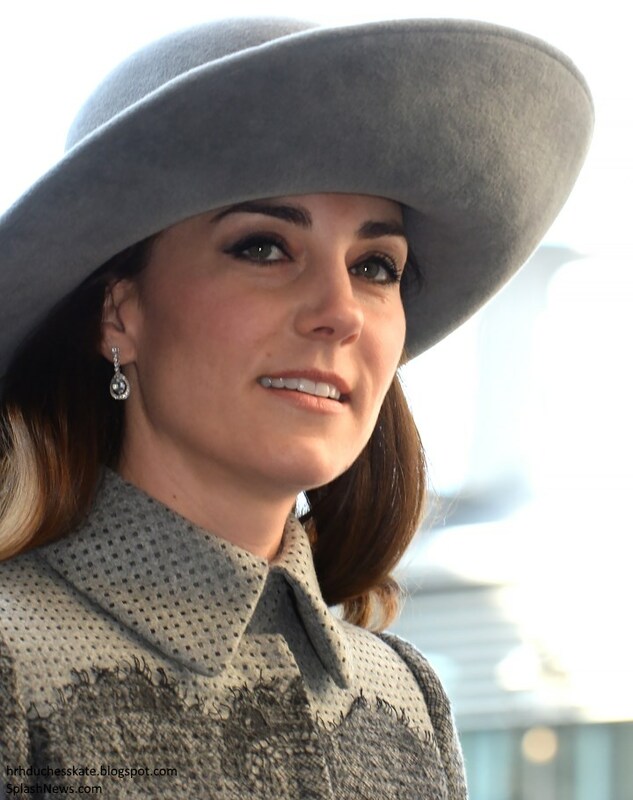 I love, love this hat, and I think that slightly matronly/heavy vibes that some seem to be getting might be mitigated if Kate wore something that weren't so buttoned up with a large collar. I thought the look was a bit heavy, though I liked that it was different. I think a red shoe (or maybe purse?) would have provided a wonderful and much needed pop of color. True but it would also have been eye-catching which she seems to avoid even more when in company of the Queen. Julie, you said exactly what I was thinking about the outfit. And, I also thinks she looks stunning. A very memorable outfit. I love the hat, so romantic. How just HOW can anyone like this outfit? Stunning...really? It looks awful! Such the wrong color for the occasion! This isn't a memorial or funeral so I don't get what she is thinking? Are you guys just saying its stunning because you like what she wear just because it is kate that is wearing it? Let us be real...if you saw anyone else wearing this i bet you guys wouldn't think that person looked stunning. I just can't. I don't get anyones love for this coat. Look at what the queen was wearing. It was bright and colorful and appropriate for the event. Well, it appears that bashing Kate has become a sport around here. The ink on Charlotte's post hasn't dried and here we go AGAIN. And for the record...what was she thinking? Perhaps she was thinking about the Queen's coat and opted to wear a neutral color. Tactful and classy. Wow, calm down. Everyone is entitled to their opinion. It's just clothes! I LOVE THE LOOK FOR THE LOOK. I am with your royalfan! Here we go per usual. Grey IS Springy. Also while it's an uplifting event it is still in a church and requires some elegance and class. The colour was appropriate and the Queen. Provided the color....as she should. Take a look at similar events Anon 21.22 and you will see that at such events no one is dressed like a Easter egg...as in bright colors. Except the Queen usually. Brava Catherine! You looked smashing and elegant. That hat is to die for! I want one! We all need one! Royal fan. I totally agree with you, the ink is not dry and all the haters come out. But that all that ever is here for the most part anymore. It used to be a nice blog to read but for the past few years it seems just Kate haters comment. Notice the photo of w/k, Harry and the Queen. you almost don't even notice Kate because she is in grey. The Queen, in blue, is center stage because of the bright blue. Coincidence? I don't think so. Another "Kate thing". I think even after the reception there they were going to have a reception with just the royal family. I read that somewhere today, I just don't recall where at the moment. her grey outfit with be around the lady in blue a lot today. considerate choice Kate not to try to outshine a fashion conscious 90 year old woman who happens to be beloved family and Queen. 21:22, I am one of many who LOVE her outfit. There will be other days and other outfits. If Diana wore this she hailed as fabulous. Not much of a double standard, is there? I would wear this outfit myself, so no I would not be critical of it on someone else. And I am being real. Rebecca it hasn't beenjust about clothes for a while now. I would wear this outfit also Tedi. I think it is beautiful. Rebecca - I'm with you - here is a post that is mostly about clothes - it's an unusual looking coat - some love it (including me) some don't - and all of a sudden the Kate syncopates - and I'm intentionally using a word I generally avoid - because that ugly and unnecessary word "haters" is being loosely tossed around again - are trying to raise trouble. I've followed this blog since the beginning and the only thing that has changed is the course many of us expected William and Kate to take. People have been whinging about what other people say for a long time now - if we could just respect the fact people are entitled to differing opinions - Charlotte has made that clear - and that most people give some thought to their opinions, this blog truly would be a nicer place. I've seen many comments that I've disagreed with, but I respect that person's right to express themselves - and can't see why that is so difficult. Anonymous 0.00 - if Diana had worn it, just as many people would have liked or not liked it - there was plenty of dissention about Diana's clothes - some of it well deserved - she wore some quite odd things. Over on OSS royal ladies' clothes are critiqued all the time - this is nothing unique to Kate. Just like the helicopter business is not unique to Kate. I don't think the colour has the slightest bit to do with what the queen wears - the queen chooses to wear bright colours - Kate often doesn't - i.e. the beautiful and much mentioned coat in Australia. The queen was not there. Personally, I think Kate looks lovely in grey but if others don't, that their's taste. Kate "bashing: is not a sport - most of our comments are very serious -- Kate is a public figure - she is a woman who will one day hold an extremely important role - and what she does or doesn't do on the road to that role is far more important than what she wears. Actually, by saying there can be no criticism of her actions, it trivialises her - turns her into a paperdoll. She is doing some very fine work - but there are issues about whether that is enough - and when Kate is past the age where youth and beauty attract apologists, that will be what she is judged on - people love the queen because of her dedication to duty - not because she once was a pretty young woman in lovely gowns - and it will be the same for Kate. I think my wretched spell checker which barely works changed sychophant into syncopate - clearly recoiling at a word I so rarely use and hope not to use again. I agree with everything Rebecca said up above about the service. Such a beautiful and joyous celebration of the Commonwealth, especially for some of its younger members. For the clothes..... I love, love, love, love the hat!!! It is wonderful to see the DoC wear a bigger hat. It offsets the coat perfectly and frames her face beautifully. The coat would be incredible if it fit well. It needed to be tailored from the shoulders through the torso. It gaped and bunched where it really should not have. I do admire the mix of modern material with the overlay of lace. It is a fascinating design. Lastly, I wish the shoes and purse had matched the shade of the hat. All of her accessories are a different shade of grey and, so, the effect was kind of jumbled for me. If the coat had fit to perfection and the greys had matched this would have been a breathtaking outfit. Thank you Charlotte for beautiful coverage of the day. Complete miss. The coat is hideous. Wrong on every level...color, fit, tailoring. Greta are all over the place. It is refreshing to see her in a hat, but her hair really should be up. I feel like she's lost her polish. I love this coat and hat. I don't like them at all on Kate. The coat looks too bulky and heavy and - for whatever reason - the lacy black print just makes her look short and stumpy, of which she is neither!! I'm thinking the belt would have been better, to rope the coat in the middle a bit. It's just - a LOT of coat and it's a heavy fabric so it photographs as big and shapeless and bulky. As has been noted, the oversized collar makes her neck look short or nonexistent. 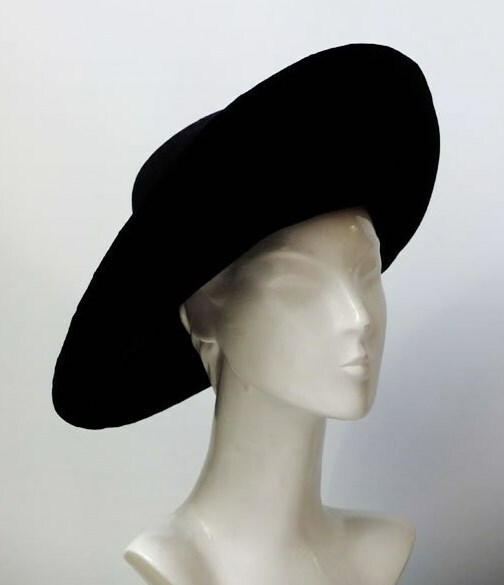 I am not as big a fan of these style hats, they tend to really overpower a look and the wearer's face. I didn't like them on Diana either, even as tall as Diana was, they tended to just overpower her face. totally agree that the outfit would really benefit from a dark belt. I don't mind the high neckline and I love that she's using a larger hat. It reminds me of the fabulous hats worn by Queen Maxima. I love QEII's brooch! I've longed to see Kate in a hat, and I do love this hat. But not with that hair. It should be in a low updo. The coat is awful, just awful. 3 different shades of grey between the hat, coat and shoes. Kate seems to have lost her polish. Jumpy claps for a proper hat! Beautiful look for the DoC today!! Wanted to throw this out there and get some thoughts ... lately, Kate is looking very old and very tired. And when I say "very old" I mean older than her 34 years. Her skin just looks lifeless and sallow. She looks tense and unhappy and her smiles seem more forced than even a year or two ago. I was looking at some pre-wedding and immediate post-wedding photos of her and, honestly, it looks like a completely different person in those pictures. I'm not attributing it to anything in particular but has anyone else noticed that? Even in the ski photos, she looks older than her years and tired and just not very happy, to me, at least. That's an interesting question. I would imagine the stress from what is being written in the press and on blogs takes a toll, especially right now. I can't imagine knowing that every time you walk out the door, someone is there to report on your appearance and actions, then people like us are here to dissect every bit. What we think of every aspect of a collar or a bulge in a seam, if her hair is shiny or dull, was her small-talk witty or silly, should she be shopping too much and working too little, whether she has one or three nannies, is she holding her child correctly, does the Queen approve... I do it sometimes here. We all do. Whether it is a positive comment like I wrote above or a negative one like I wrote at the James Bond premiere where I compared her dress to my grandmother's nightgown, the hundreds/thousands of us analyzing her must take a toll. Right now, I'll bet she's feeling it. She did marry into this voluntarily, but it must be exhausting at times and I am sympathetic. Maybe it's something completely different, and I don't think she looks as worn down as you do, but I agree that she looks very tense (as you said) in some unguarded moments. My guess...a two year old and a baby has something to do with it. My thoughts: it seems we must be looking at completely different photographs! Apart from looking suitably solemn as needed, the Duchess, who must be one of the most beautiful women in the world, continues to look vibrant and very happy. As well she should. I have noticed she looks much older than she used to. Being that she and I are almost the same age and our last two children are almost the same age (I have two more), I feel often that she's in the same sort of mom frump many women are at this stage of life. It doesn't mean we're not happy, just busy and tired and not 23 any more. I suppose one would expect her to do whatever wealthy and famous people generally do to look better than the rest of us, but I enjoy seeing a little of the reality of life on her face. And I hope she really is happy despite so many truly life changing events for her in recent years. I thought the photos with the family in the snow radiated happiness. All the videos of interactions with William show warmth & closeness. Every indication we've had so far is that she's really enjoying motherhood. She did look tired on some occasions in the first 6 months after the birth of Charlotte just as she did after the birth of George. This is to be expected as the first 3 months especially are incredibly intense. It's not just the demands of a new baby but also the effects of the post partum hormonal download & she suffered from HG which would leave its mark. She's been back to her old self again recently. And she does have some lines because she's getting older & is juggling a lot of responsibility. She's still a beautiful woman who makes a lot of effort to dress for the occasion. I was with my grandmother on the weekend who's 89 & started making scrapbooks of the RF when she was a small child. She wanted to look through some of her scrapbooks of Diana. You can clearly see Diana ageing in the photos - she looks different at 34 than she did at 20 but is still a striking & stylish beauty. Ditto the Duchess. Modern cameras also play their part. When you can take 30 images+ per second then you can capture every stage of an expression. When I look at the still image at the beginning of the arrival video William & Kate don't appear to look happy but as soon as you play the video you see that they're in the process of smiling. A very sophisticated & elegant look. 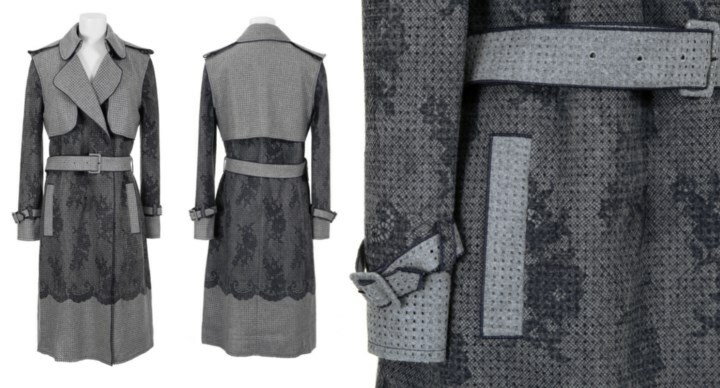 I love the contrast between the lace overlay & the edgy, laser-cut grey fabric. The hat also emphasises the fineness of her features. Overall she looks stunning. It would be very easy for the Duchess with her height & looks to steal the show every time. The muted colour of the coat lets her blend in while wearing a striking piece. As a result it's the Queen in her blue suit who draws the eye in the photos. Given she's the head of the Commonwealth that's appropriate. I also loved the Eponine suit - very Mad Men! It's fun to see the Duchess mixing it up. I like the look - for the dead of winter and a more somber occasion. It is early spring and this was a celebration! Did Kate wear a dull color so the Queen looked more the center of attention? I do love the bigger hat though. Not a huge fan. As someone else mentioned, there are too many shades of grey and it is distracting to the eye. Especially the shoes -- the shade is really off. Also, the coat collar is a problem. Looks like they took the original trench collar and stuck it on the plain coat, and that just doesn't work. I think the trench would have been a much better choice -- a little risky for conservative Catherine, but the belt and collar would just enable the outfit to make more sense. Why redesign the original concept? This coats just looks frumpy and boring and desperately needs a belt or other detail. Love Catherine, but not this look. The greys do not look very different on my monitor. If anything, the hat matches the lace and the clutch and pumps match the background fabric of the coat. I think they are all quite harmonious. Thanks to everyone. The atmosphere in today's blog reminds me of how it was at first. Now if only we can continue like this and all benefit from something we all clearly love without having to pull hairs and turn all nasty. Definitely like this. On a side note I think its only me but when I first saw pics, Kate looked really different and mature (in a good way). Very classy and I guess her experimental phase from autumn last year is still continuing. I noticed that also, Michael. She is "growing into regal" I guess. I mean she has met Presidents, Prime Ministers, Ambassadors, Queens, Kings. She's taken on some intense issues. She's had two children. She's not a school girl anymore. She looked more somber today, not sad, but somber. Definitely demure, maybe? Maybe it was the hat? I don't think it's only you, Michael. I also have the feeling she is more mature and looks very elegant. As a mother of two, she just can't look like she did 5 years ago, it wouldn't make sense. To me, she looks even prettier now. And I think it must have been a beautiful service. Not her best look, unfortunately. She is wears clothes really well and has a stunning face so she can pull off an ill-fitting frumpy hat and a boring coat. I like the hat and coat separately. I don't think they pair well together. I love the outfit. Love the hat. 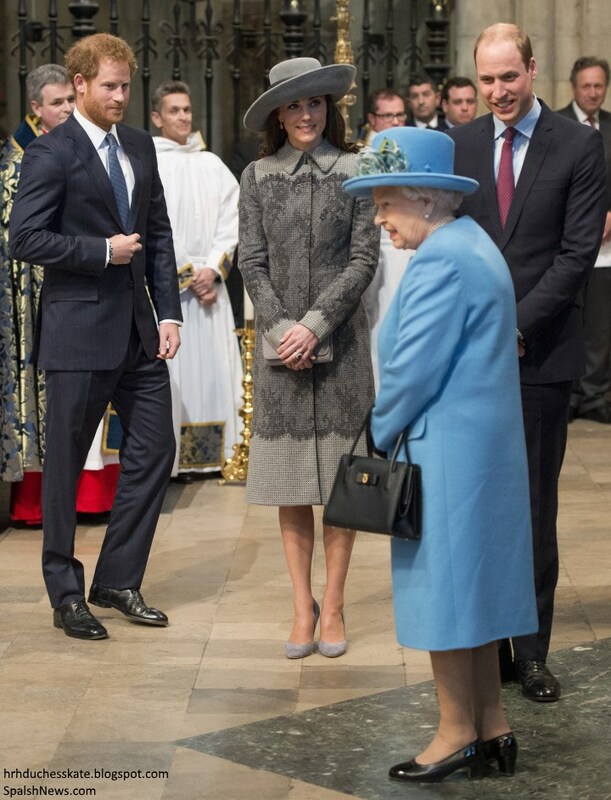 The photo of William, Kate, Harry standing by the Queen is probably the reason Kate wore grey. What color shows the most in that photo? Thank you for all the additional photos Charlotte. I agree a love or hate outfit! Sorry, don't like this look. I see what Kate was trying to do here...maybe trying to look a bit more mature and elegant...but she really didn't pull it off. I think both the hat and dress could work well separately, so maybe the hat with a younger looking dress, or the coat with a facinator. Or maybe if they were both a brighter colour? Kate's mannerisms are not exactly poise and elegant either, so it's hard for her to pull off a look like this...it just doesn't seem like she's being true to herself. I would like to say that I am the one who posted the comment right below yours, and I wanted to add to that. I still think that eveything I said we need to try, but also I think that I should have added that Kate needs to be herself!! A have a few differed opinions about this outfit. When I first saw it, the dress, hat, etc. I didn't like it or think I would. But, I for one, am someone that says "absolutely everything looks good on Kate!" but, then still, have dresses, hats, shoes, that I like better on her than others. There are some outfits that I guess could go into the category of not liking too much, but if I look at it differently and say to my self "think for a minute!! That's Kate! It's beautiful!" it again turns beautiful! But, after I looked at a few more photos, I think it is a beautiful dress!! I still do not think that it is one of the MOST pretty that she has worn, but I still really like it on her. Another thing that I wanted to comment on is that I really like that she's been exploring her dress/outfit options!! She's been wearing diffrent dress, hats, etc. than before. I like how she's exploring her options. I loved the way she dressed before, I also love the way she has for the past month or so. So, I think we all need to just take a minute and say "Hey!! That's Kate! Let me take a few looks at it, look at different photos, look from different angles! I know, that one way I look it's going to be beautiful!!" Sometimes it has to do with the angle you are looking at it at, or how quickly you look. Again, I would like to thank Charlotte for her hard work and dedication to this blog!!! We all need to thank her once in a while!!! I hope you all have a great Tuesday!!! If this blog was all mushy without any constructive discussion it would be sickenly boring. I appreciate all the interesting dialogues. I was skimming the blog quickly and I saw that you had listed the earrings as UFO. I thought to myself quickly hmmm I have never heard of that brand and then it dawned on me. lol. Rebecca thanks for all your efforts so far to try to identify the UFO earrings. I have a feeling they might be part of an ensemble. Hopefully, someday someone will write a magazine article or book about all of Kate's Jewelry and its provenance, then no more UFO pieces. I think they earrings must be vintage and, therefore, impossible to trace. Thank you so very much, Charlotte, for the excellent post, with the lovely photos. I always think the Duchess looks beautiful, and my thinking of her ensemble for today is that she was trying to pull off a more mature look. Being seated near the Queen, Catherine didn’t want to stand out, and being in the church while still winter, she chose the grey. Possibly, with the Duchess of Cornwall not there, Catherine tried the larger hat. I think Catherine would have looked quite stunning in the hat had she worn it when her hair was long and with the pretty curls. However, it could be that I’m just not used to seeing her in a large, Duchess of Cornwall style hat. That Camilla has adopted this style of hat for her own “signature” hat would be enough for me to avoid it, but the Duchess of Cambridge is able to look gorgeous in anything she wears. The Queen looked fabulous, as always. Long live the Queen! I love the hat and curls. Not a fan of the coat or her constant buttoning everything up to her chin. Sorry to say but I'm growing tired of the boring shoes. But don't want to be negative so will say she looks fabulous! Thank you for your interesting and thorough post. Finally a hat worthy of our Duchess! I'm no longer upset about St. Patrick's Day because I have seen the hat and it works! This is gorgeous. She looks so beautiful in it. Even the photo of her hair and the hat from the back is stunning. She should wear this style far more often. I'm so tired of those little "salad plates" perched on the top of her head. This frames her lovely face. The coat looks very elegant with the same toned accessories but it seems not to fit her very well, especially across the chest. But I generally like Erdem and am proud that he is Canadian-a good choice for the Commonwealth service. Going back to look at the photos of the hat again! Well, I'm with the "liking it" camp. The gray is a very bluish gray in some shots, which is very spring-like. In other shots it has a late winter (which it is) vibe. While it could function as a mourning look, the lace keeps it happy enough for me. I like Erdem. I wish she'd choose more of that line. I especially wished she'd opted for the dresses which went with the emerald green one. I like the hat, too, and have often noted that Catherine favours a monochromatic head-to-toe look. It's a personal style thing, I think. I understand that well: Sometimes very lovely things that others like on me on me and may even be on trend are just not "me." Like many others, I think she works hard not to draw attention when the Queen is present. Switching up the hat and the lace make a statement, but not one that overshadows HM. I would also like to see the Easter coat reprised--and a link to the website with the details. Hi, Philly, :) so good to "see" you! - And I so agree with your comment. You missed Prince Andrew. He also attended today. He was sitting next to Prince Harry during the service. Just to note to: William's Private Secretary Miguel was there too. He's behind William's shoulder in the seated picture. The Queen's assistant Private Secretary is behind William's other shoulder. I'm a fan of gray so I think Catherine looks lovely. Not at all "too mature". Lets remember she is a mother of two and in her thirties. It was also an event held in a church and thus a more sedate look is required. Sedate look yes but not this gloomy. It makes me sad not joyful and this was a happy occasion. I am in the camp in favor of this hat and coat. The Duchess looks especially good today. Who are the three people walking behind Prince Harry and the Duke of York in the cathedral procession? They also sat behind the royal family during the service. First to start off with something positive: I love the style of hat and the earrings. She has so many beautiful coats to wear. This is not one of them. Side note: I loved what Rebecca deacon was wearing! On this Blog we have a wide range of opinions about the clothes the DoC wears and that's a good thing. Think how boring it would be if we all thought exactly the same way. And of course as we have differing tastes in clothes and other things, Kate will not always be wearing things we like, or doing things just the way we want, so maybe we just have to accept that and not get uptight about small differences of opinion. Thankyou Charlotte for all the background work you do to keep us so up to date. I'd be interested to know how many hours a month you put in to it, especially when they are travelling overseas? This is the first time that I don't like her outfit. It's not the colour - because she was wearing grey before, and it looked nice. The design of the coat is ugly. and so is the hat. It's not her usual good taste. Lovely look - reminds me a lot of Crown Princess Mary of Denmark! "Fields of Gold" written by sting? Is that the song that was song? I read the lyrics and am trying to find out why that song was sung at that ceremony. The lyrics have nothing to do with that. The lyrics are a little racy and about two lovers? Absolutely LOVE the hat. Hats are a totally underused fashion item. Bring back hats. In fact the whole look was great as far as I am concerned. I think she looked understated and elegant and yes I was very strongly reminded of Downton. A very Lady Mary dress.IMHO there has been a big change in our Duchess over the last few months. She seems to have found her feet and has the confidence to try new things both in her fashion and how she is approaching her life's work. It is much better to go quietly and slowly at first and make less mistakes. I am looking forward to seeing how this year develops. And perhaps to conclude we all should take cognisance of The Queen's speech. It is pertinent to us here. Thank you Charlotte once again for an interesting and informative post. My first thought when I saw her in the hat: the cat from Puss in Boots. LOL. The ensemble looked really good on video IMO. This same week Queen Maxima of the Netherlands wore a pale pink ensemble that had that same vibe to it--the lace and the plain and the big hat. I liked Kate's better. The Queen looks lovely in her blue ensemble ( she has always reminded me of my granny). Kate looks gorgeous in the grey. She compliments the Queen visually, and does not compete with the Her Majesty, that is why I think she choose this colour. The Queen is the "portrait" and those immediately around her are the "frame". Kate looks beautiful and classic, I love the hat!!!! Really love this outfit. Love seeing her in a hat! And those shoes are rather lush! How she always appears to be so comfy in heels is amazing, I always suffer! Maybe time to invest in a really good quality pair! Races this week at Cheltenham. I did wonder if we'll see Kate and William make an appearance there sometime soon.